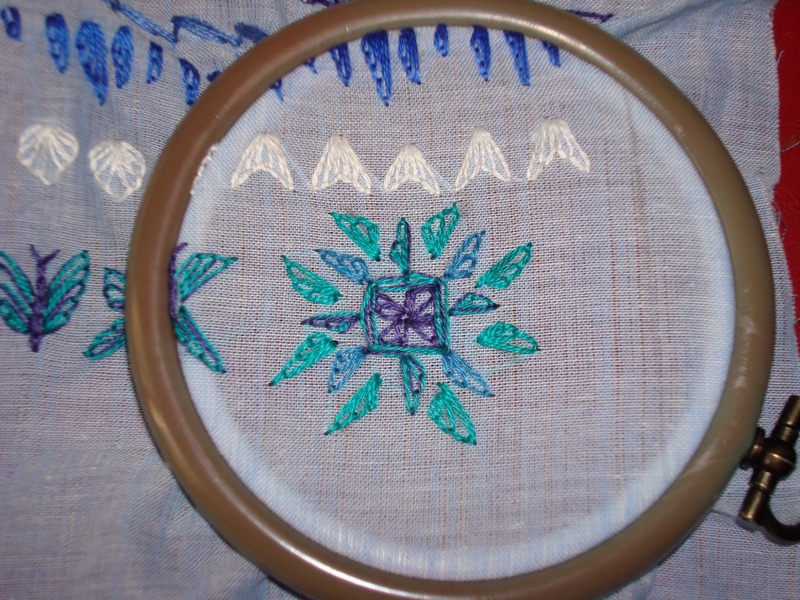 The 23rd week stitch of the stitch challenge by Sharon, TAST2010 is waved chain . This line is stitched in zig-zag pattern. 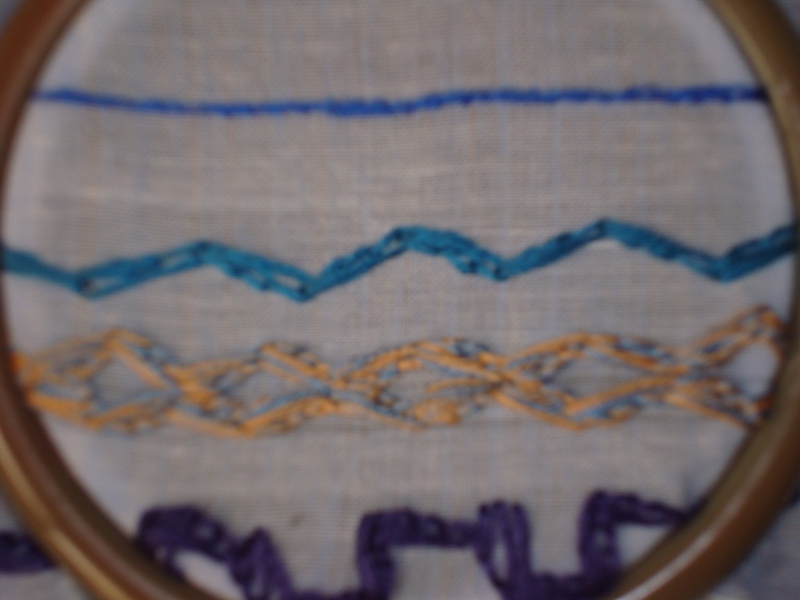 – Adjacent lines of zigzag waved chain st.
-the stitch is done right angled-not perfectly ,ofcourse. In this the thread went around the needle 3 times[instead of 2],I did 5 stitches as line stitch and did some individual stitches too. 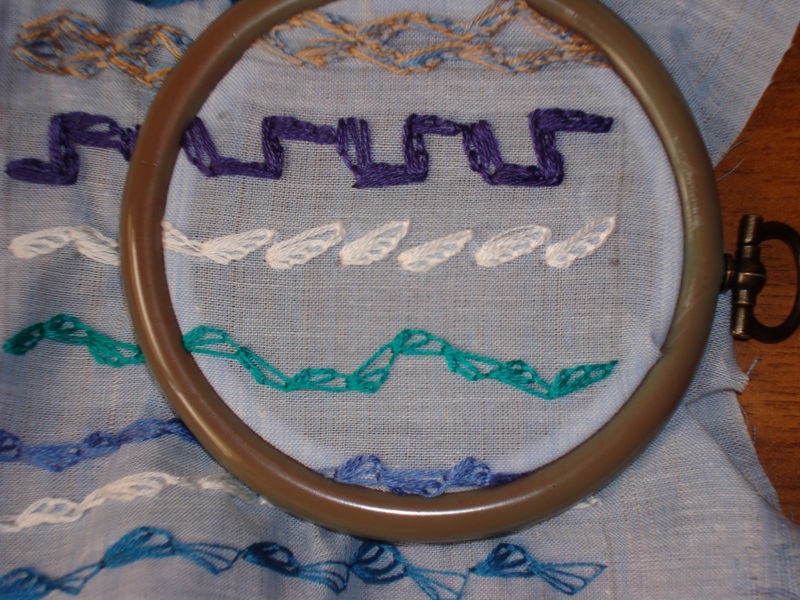 the stitch is done in a curved line. 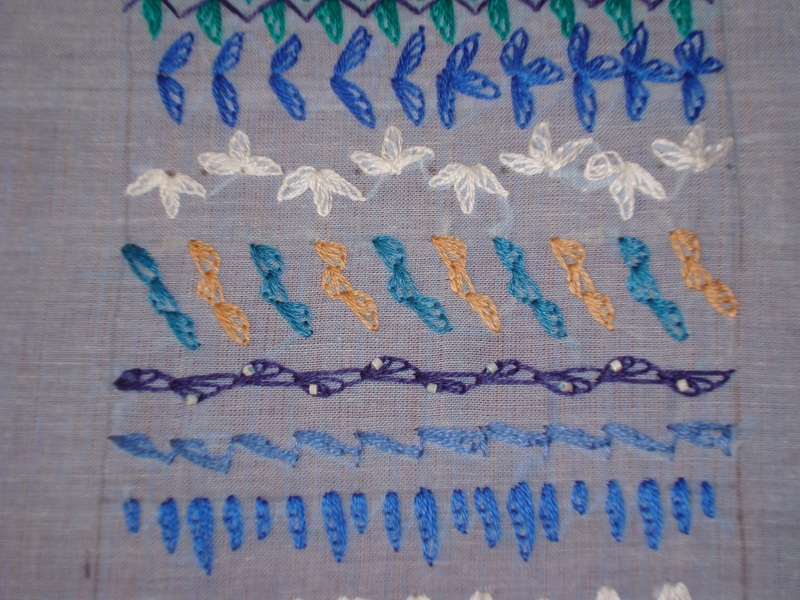 In this line the first stitch is of small width, the next longer width. One normal chain alternated with waved chain. 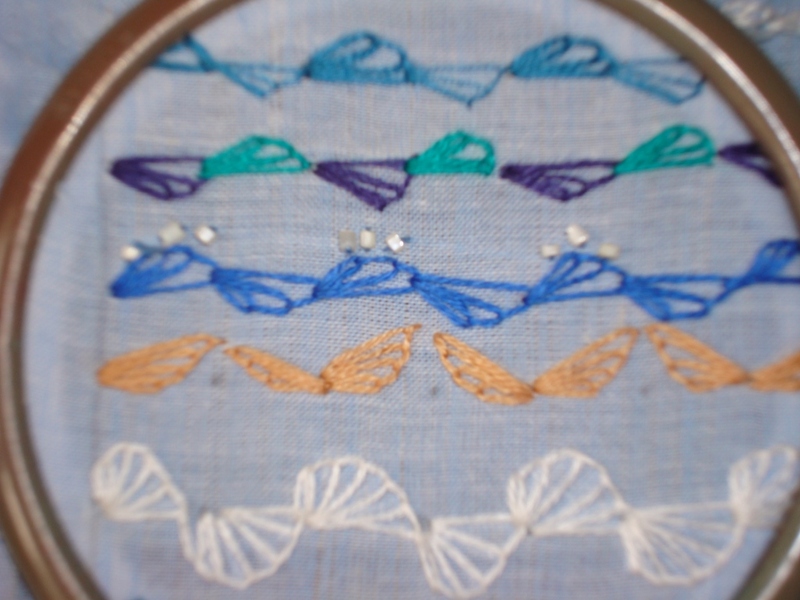 One stitch in 3 strands , next one single strand. 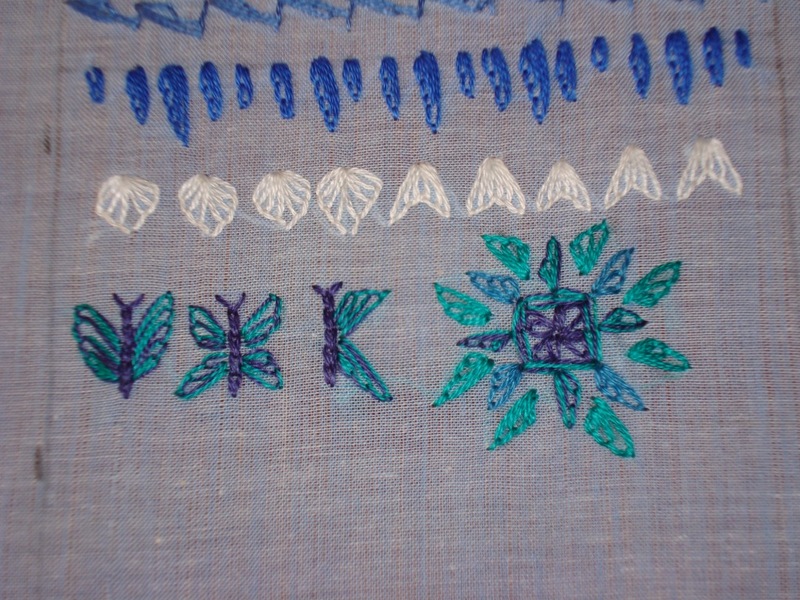 This line is done in 2 colours,first as a normal line, then the stitch done on one direction. I added beads to this line, not very eye catching, I know. The individual waved chain [or]waving chain? are facing away from each other. This line I stitched first chain stitch vertically,then proceeded to add as many stitches till I got a curve, the next stitch, the same thing in opposite direction. With all these efforts, this looks like quarter buttonhole wheel. 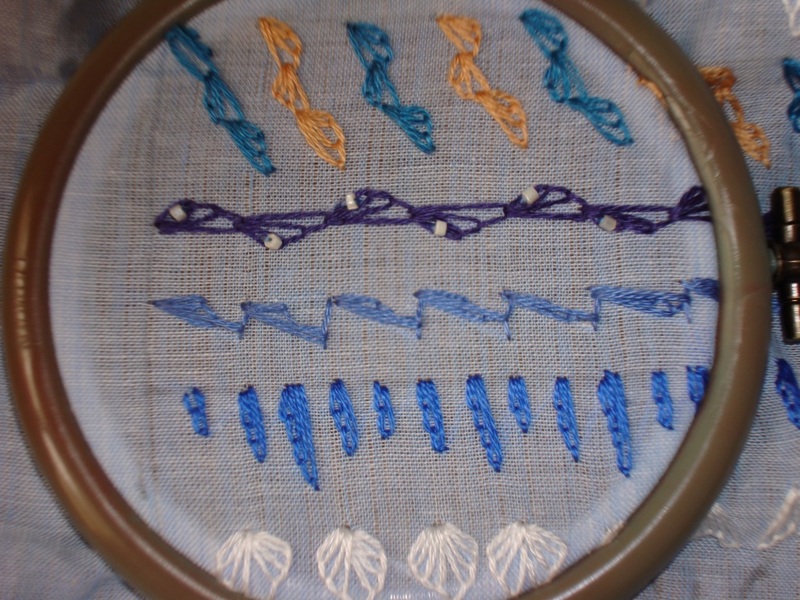 After doing the first chain, I tried varying the placement of the next stitches. 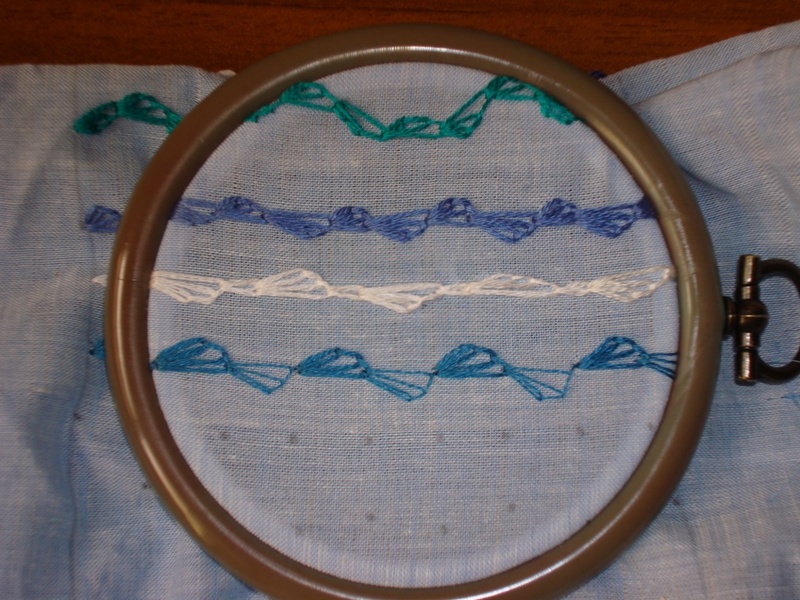 One line of buttonhole stitch,with single waved chain. 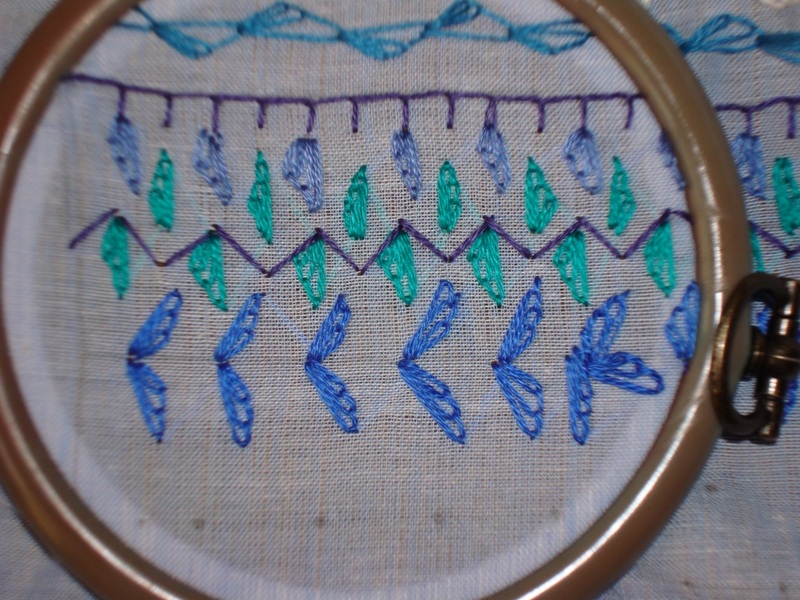 Arrowhead stitch, waved chain done on top and bottom. Variations of single waved chain. I arranged 3 single waved chain as an half flower, and did a line of that. A bead is added to the basic chain. 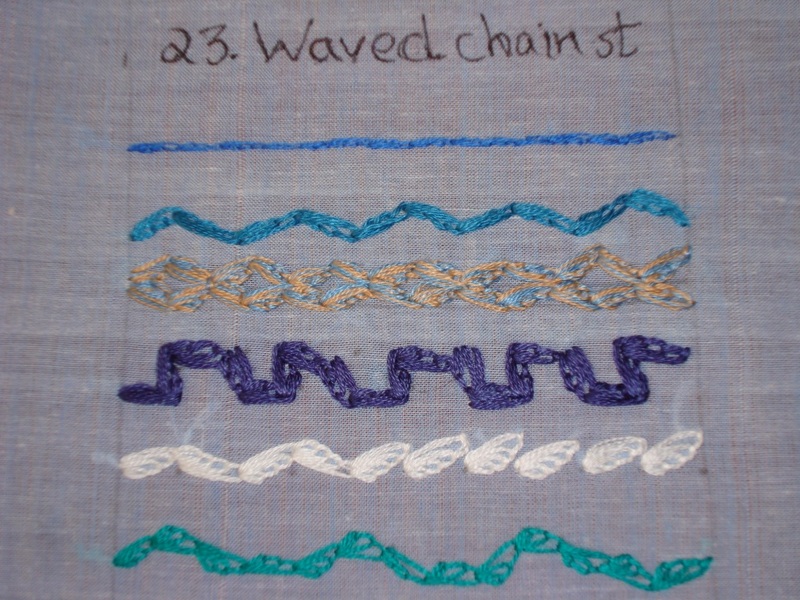 One waved chain completed with a straight stitch, done in zigzag manner.
. 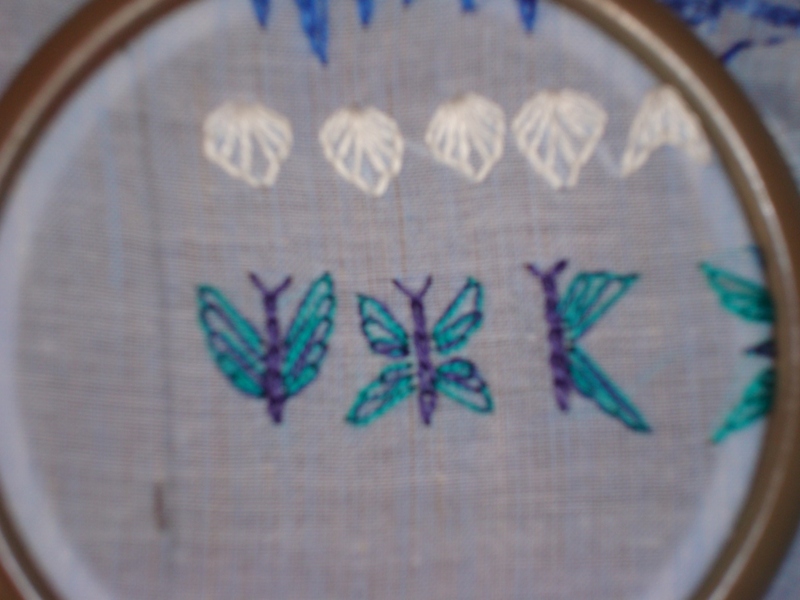 I varied the height of the stitch in this row. 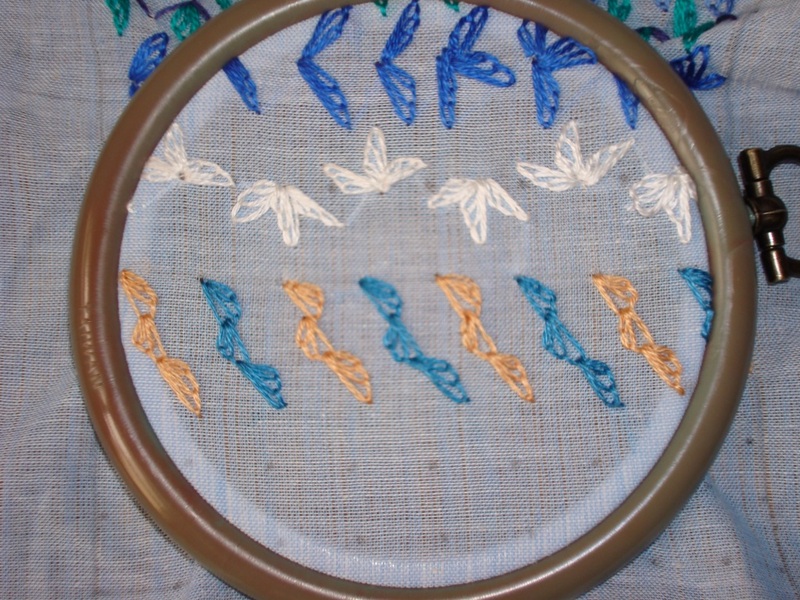 Tried to converge 2 waved chain stitches,.this gave an idea of doing butterflies with this stitch. Tried a motif with the individual waved chain. the Stitch sampler is completed here.While I was doing this sampler, I tried to write each and every row, it was quite tedious,but don’t know whether it is useful.But this sure is avery long post. the sampler is 13 inches long.